Mexico City (VNA) – A delegation of the Communist Party of Vietnam attended an annual international workshop entitled “Political parties and a new society” held by the Labour Party of Mexico (PT) in Mexico City from April 4-6. 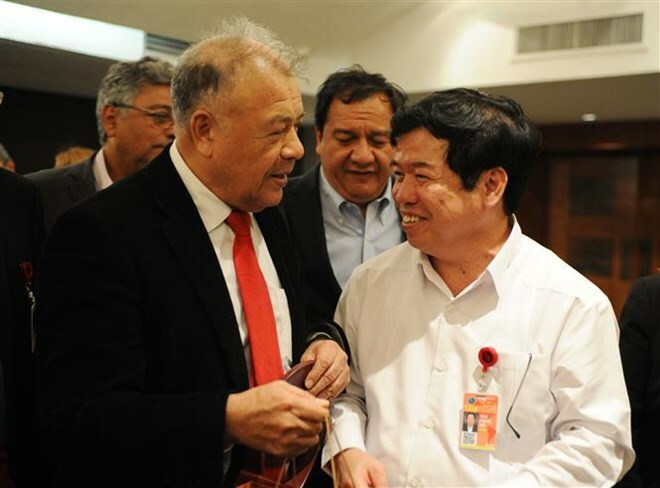 Addressing the event, which attracted nearly 500 delegates worldwide, head of the Vietnamese delegation Nguyen Viet Thao congratulated the leftist movement in Mexico for their recent achievements. Thao, who is deputy director of the Ho Chi Minh National Academy of Politics, noted that the workshop, the 23rd held so far, has become a major and significant platform for the leftist and progressive forces in Latin America and the world. He expressed his belief that the event will continue making important contribution to strengthening the solidarity bloc of leftist and progressive parties in Latin America. The Vietnamese party delegate highlighted the great accomplishments of leftist revolutions in Latin America in the first two decades of the 21st century, including reiterating the value of Marxism-Leninism in the current era, outlining the methods to carry out revolution in the context of globalization, and supplementing theories and ideas to Marxism-Leninism based on the reality in Latin American countries. Speaking at a plenary session, PT leader Alberto Anaya emphasized Vietnam’s rising role and position in the international arena, describing the CPV as a model for leftist and progressive political parties in the world. He also expressed his wish to promote the traditional friendly ties between the PT and the CPV, and between the two countries. On the occasion of the workshop, the PT and the Vietnamese party delegation introduced a book on selected pieces of writing by President Ho Chi Minh on peace, democracy and gender equality.